Seven particles of dust brought back to Earth by a spacecraft nearly a decade ago appear originate from beyond our solar system. The exotic dust was identified by researchers with the help of 30,000 worldwide citizens. The material was collected by the Stardust spacecraft, a 300-kilogram robotic space probe launched by NASA on February 7, 1999. Its primary mission was to collect dust samples from the coma of comet Wild 2, as well as samples of cosmic dust, and return these to Earth for analysis. It was the first such spacecraft of its kind. It featured detectors which worked like cosmic fly-paper, gathering as much dust as possible. In 2006, the shuttle parachuted the detectors onto Earth, where they started to be analyzed. The specks have all the hallmarks of being created in interstellar space. If the analysis is confirmed, it would be the first time interstellar particles are brought back to Earth to be studied. The dust was probably created by a supernova explosion millions of years ago and shaped by exposure to the harsh extremes of space. “These are very precious particles,” said Andrew Westphal, a physicist at the University of California in Berkeley, who worked on the dust. Virtually everything we know about interstellar matter, either ground based, or with space telescopes; studying it directly could provide valuable insights. “We seem to be getting our first glimpse of the surprising diversity of interstellar dust particles, which is impossible to explore through astronomical observations alone,” Westphal added. 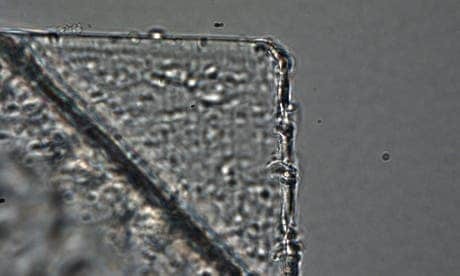 “In the end, 30,000 people around the world worked through thousands of digital microscope images of the main part of the collector, the aerogel, and eventually found the tracks that included interstellar dust particles,” he said.